With all the new restaurant openings in London it's important not to forget the ones that impressed you a year or two ago. New openings can ride on the crest of the buzz created by PR machine, bloggers and word of mouth and the old stalwarts have a loyal following, but it can be a tricky time for those whose honeymoon period has passed. It's a time which sorts the wheat from chaff and restaurateurs have to be on their toes to build on their early success. Gauthier Soho is one such. A long overdue return recently reignited my enthusiasm for the classy French cooking of Alexis Gauthier. After covering all the bases in classic French cuisine, Gauthier entered the kitchens of Alain Ducasse and, as he puts it, learnt to cook by trusting his instincts rather than by following a recipe. Carnivores are well catered for but Gauthier is also a chef with a love of vegetables and one who is not afraid to put them centre stage rather than as little background dressing. This he does inventively with his 'Vegetable Menu', just don't expect it to be wholly "vegetarian" (unless you ask). In fact four menus are offered - A la carte, a weekly-changing Seasonal Lunch/pre-theatre menu, Seasonal Tasting and Seasonal Vegetable Tasting menus. Personally, I can do without the calorie count printed below each dish. For those who care, Gauthier Soho has a Michelin star. Yes the table linen is white and the napkins fine but the look is unfussy with all the attention on the food. This is not everyday eating, but it is real value for money. The £33 three course lunch including a half bottle of decent wine (£25 without wine), plus service is great value. You can also choose three courses from the a la carte for £40. A couple of small palate ticklers arrive unbidden during the meal but, mercifully, without any great fanfare. The wine list extends to over 200 bottles with plenty of reasonably priced choices. The menu changes weekly and though it's not everyday eating, it is great value for money. Gauthier's cooking is unmistakably French and the saucing is impeccable, but his passion for vegetables, and an enthusiasm for Eastern cuisines, brings another dimension to the cooking. From the set -lunch menu comes a perfect Risotto starter made with the first English (grown under cover, surely) asparagus, a slick of chicken jus and a parmesan crisp. We could have chosen a Pea Veloute or a dish of foie gras. The a la carte tempted with a "Very Green Ravioli" which turned out to be a spinach (probably) ravioli with peas, asparagus, rocket and dandelion in a miso broth with Earl Grey tea and Yuzu. Very light and virtuous but it didn't quite deliver the iron-rich hit I was expecting. Set mains included Duck breast with an aromatic jus, and an Open Ravioli of Tofu. A comforting dish of Skate wing, served off the bone with fennel, both soft and crisp, and a light sauce was cut by lemon and capers. It was the best use of this gelatinous fish I've ever experienced. 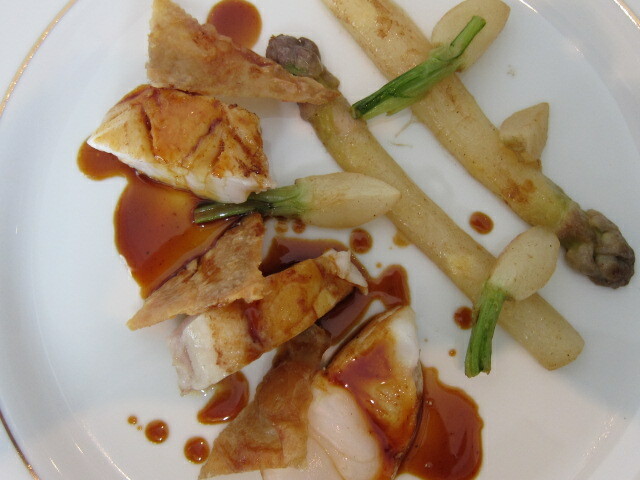 From the a la carte came meltingly soft Monkfish served with that gorgeous chicken jus, crispy chicken skin, white asparagus and baby turnips. A tiny but delicious bowl of aerated yoghurt, poached rhubarb and fresh lime was served before dessert. The chocolate pudding Louis XV is a fixture on the menu. It is undeniably good - a concoction involving praline, chocolate mousse and a chocolate couverture topped with gold leaf - and difficult to resist. But outside the sun was shining with a taste of spring so the first French Gariguette strawberries called to me from the a la carte menu. I know it's ridiculously early but Gariguette are always the first of the good ones so it was worth a try. They were served just warm in a lovely sticky sweet liquor flavoured with vanilla and star anise, which succeeded in bringing out their flavour. A delicate coriander tuille and a scoop of sharp lime sorbet on the side off-set the sweetness of the sauce. Having taken over the narrow little townhouse, previously home to Richard Corrigan's 'Lindsay House', nearly two years ago Gauthier has created a warm and inviting little haven in the heart of Soho. It's an awkward yet characterful space with great charm. In its Lindsay House phase it never had that essential welcoming feel to me. This could be something to do with being within earshot of a royal dressing down of some hapless chef in the kitchen on my last visit. A recipe for indigestion, I think. Gauthier Soho does not induce nervous tension. On the contrary, the staff seem happy and confident. Service is correct without any affectedness. The ground floor dining room is a discreet and romantic space. On the first floor the tables are a little more tightly arranged. The quirkiness of the building allows for a number of small rooms available for private parties. This lunch was a timely reminder to revisit those who not only start off promisingly but work hard to keep things fresh in the relationship between restaurant and diner.